When you hear the words Walt Disney World, what is it that you immediately think of? I'd venture to guess that a large percentage of the world thinks of Cinderella Castle right away. Some, I'm sure, think of Mickey Mouse. Others maybe think of fireworks or princesses. Me? When I hear those three wonderful words, the first thing I seem to think of is Peter Pan. 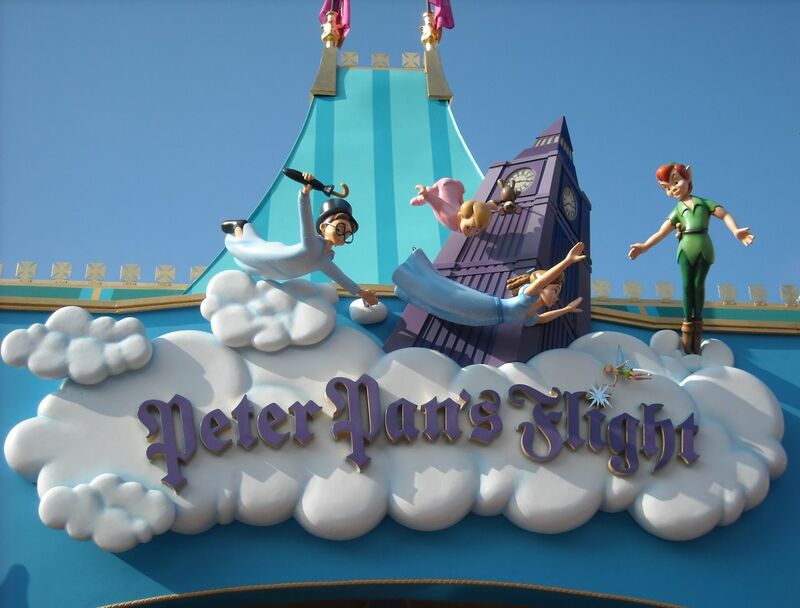 More specifically, I think of Peter Pan's Flight, the legendary attraction in the Magic Kingdom's Fantasyland. If you know me well enough, it makes total sense. Peter Pan is my all-time favorite of the Disney animated classics. It's always struck a chord with me. I guess it's because, perhaps not too subliminally, like Peter himself, I've never wanted to grow up. Therefore, it's a logical progression that Peter Pan's Flight is my favorite Disney attraction. I consider myself in good company though. After all, it was Walt Disney himself who said, "That's the real trouble with the world. Too many people grow up." So, I take pride in the fact that Peter Pan's Flight, one of the simplest and oldest attractions in Walt Disney World is my favorite. I can't possibly be alone out there. If you've been to Walt Disney World as much as I have then you're well aware that if you don't get onto Peter Pan's Flight in the first 30 minutes of the park being open, you better prepare for a lengthy wait. Sure, it's partly because of ride capacity. Peter Pan can handle somewhere between 700-800 guests in an hour. Compare that to other major attractions like Big Thunder Mountain, which can handle 1,300 or so people an hour, The Haunted Mansion and Pirates of the Caribbean each at around 3,000 and Under the Sea at around 2,000. Ride capacity can't be the only reason for long lines though. There has to be something special about Peter Pan's Flight that appeals to people, otherwise it would never command the daily long waits of an hour or more that it consistently does year after year. I've long praised Peter Pan's Flight here on MousePlanet. There have been many of you out there that agree with me. But I've also heard from almost just as many readers that totally disagree with me. "Too long of a wait for not much of a ride," seems to be a consistent gripe. That's a hard point to argue with. My threshold for just about anything is 30 minutes. If it goes above that, I'm either not waiting or, hopefully, if I planned well, I have a FastPass on my Magic Band for that particular attraction. Despite my love for the ride, I'm not waiting 60 minutes for Peter Pan. My plan of attack is to always get at least one FastPass per trip for Peter Pan's Flight or to get to the Magic Kingdom at opening and head straight to it. But, it has to be experienced on each trip, hopefully more than once, or it just isn't a trip to Walt Disney World. Let's take a look at why with my Top 5 things to love about Peter Pan's Flight at Walt Disney World. Given the technical state of the art that Disney theme parks are at nowadays, Peter Pan's Flight seems almost archaic in its simplicity. The animatronics don't move all that much. Actually, I'm not sure they really are animatronics. They're more like figures. 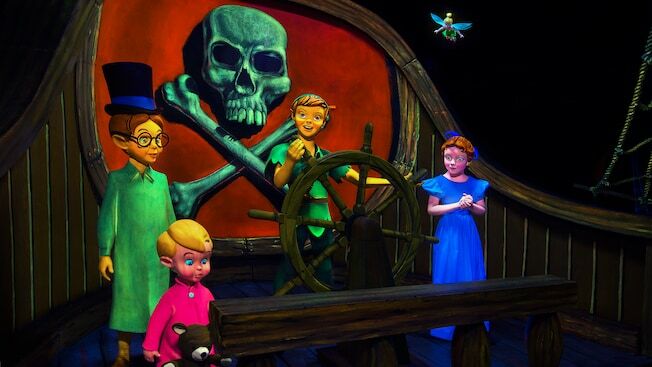 The simple but timeless characters in Peter Pan's Flight. ©Disney. There's nothing all that thrilling about it. It's not very long. There are very few special effects in play. But it's that simplicity that makes it so endearing to me. It doesn't have to be any more complex than it is. To me, it's the quintessential Disney attraction. We're transported to other lands. It's full of beloved characters. It's got great music throughout. Most importantly it leaves you with one of those warm and fuzzy Disney feelings that we're all chasing after when we're down there. The queue, which I'll talk about in a bit, was a much-needed upgrade, but I hope the core of the attraction stays just the way it is. Years ago, when Mickey's Toontown was about to close, I wrote a Top 5 counting down which props I'd like to save and keep as my own from the soon to be demolished land. If I extend that list out to the rest of Walt Disney World, there are dozens of props that I'd love to have here in my basement or in my house. Way up high on that list, pretty close to the top actually, is the moon that hangs in the "sky" above London featuring the silhouettes of Peter, Tink, and the Darling children as they fly off to Neverland. 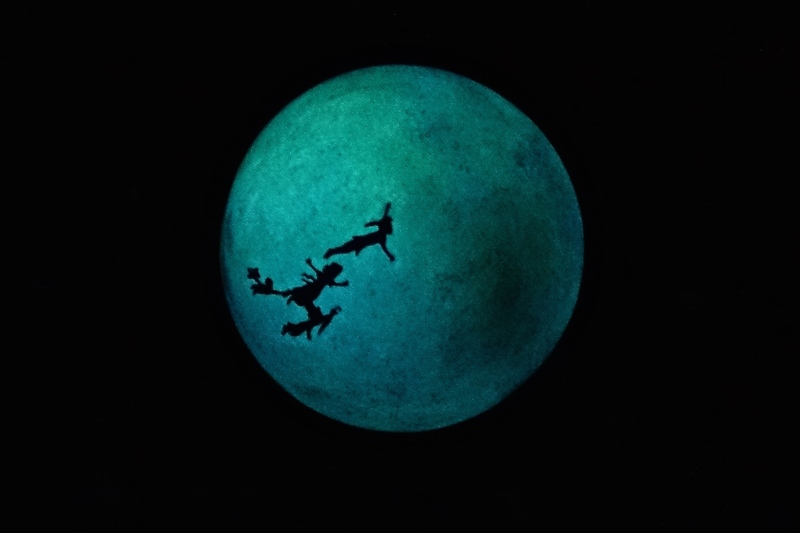 Peter and the Darlings fly in front of the moon in Peter Pan's Flight. Photo by Chris Barry. I know it's a simple little thing but I want one. I know exactly where it would be hanging in my house and if they ever have a "yard sale" of attraction items, which of course they'd never do, it's long been on my wish list of collectibles. I'm a big fan of the Day-Glo colors of the ride's Neverland room, with the Mermaids, volcano, and The Lost Boys, but the moment that never ceases to make me smile is when you're flying over London. Taking off from the Darling nursery, you see Nana in the yard, you see some full size houses and cars, and then it's soaring off into the clouds with Big Ben and the busy streets of London beneath you. 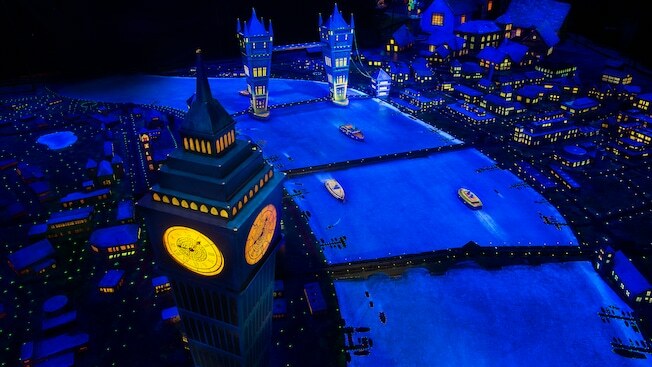 Soaring over London on Peter Pan's Flight. ©Disney. It's a classic, wonderful moment. I can't sum it up any better than the legendary writer Ray Bradbury speaking about the impact his visits to Disneyland had on him. Bradbury said, "I shall be indebted to him (Walt) for a lifetime for his ability to let me fly over midnight London looking down on that fabulous city, in his Peter Pan ride." One of the most creative and forward thinking writers of our time felt indebted to Walt Disney for creating Peter Pan's Flight. You don't need my endorsement when you have his. As I get closer to Peter Pan's Flight in Fantasyland and I begin to hear the music loop being played, I instantly begin to smile. As you get closer to Peter Pan's Flight at the Magic Kingdom the music begins to become more apparent. Photo by Samantha Barry. You Can Fly has always been one of my favorite classic Disney tunes and the instrumental version played in the queue and right outside of the attraction building makes me feel like a little kid in a matter or seconds and let's face it, that's the feeling I'm after isn't it. One thing Peter Pan's Flight lacked in its original iteration was an interesting queuing area. When one considers that the wait time to board could frequently be 45 minutes to an hour, waiting in the original queue was a pretty drab experience. That all changed in 2014 when Imagineers ripped out the adjacent bathrooms and transformed the queue from drab to amazing. As you wind through the Darling house and settle in on the nursery, there are special effects all around you. Follow Tinker Bell as she flits around the room making inanimate objects glow and come to life. 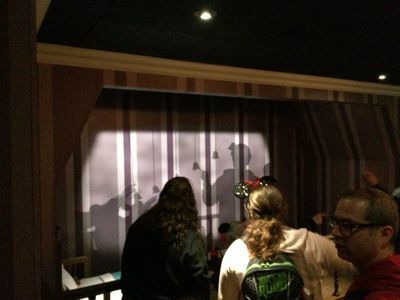 My favorite part of the whole queue is the shadow wall, where you can literally interact with and seemingly alter the shadows that appear in front of you. 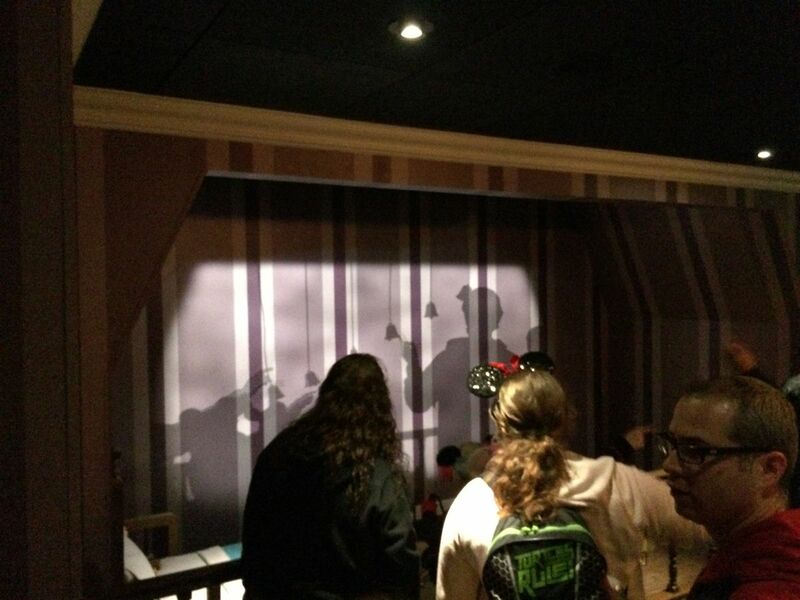 An interactive area of the queue allows guests to play with the shadows on the wall. In this case, ringing the bells. Photo by J. Jeff Kober. It's wonderful technology and amazes the little ones. Who am I kidding; it amazes me each time as well. It's probably one of the best queue areas in all of Walt Disney World in my opinion and shouldn't be missed. After all these years and dozens of rides, I still can't get enough of this attraction. I don't get tired of it. It does for me what Walt Disney World is supposed to do to you. It transports me, transforms my mood, and makes me feel like a kid again. I have no problem with the fact that my inner child is alive and well. I unapologetically wear my Mickey Mouse watches everyday. It keeps me young. It keeps me alive and reminds me of the wonder that is so inherent in the young soul. When I hear You Can Fly, as I wander through the Darling's nursery and follow Tinker Bell around the room and as I board my pirate ship and fly over London to head off to Neverland, I'm a happy young soul. Walt knew that when he built the original ride. He knew that kids would love it. But, being a big kid himself, I like to think he knew that us 50-year-old kids would also love it and we've been loving it for almost 65 years. Once again, I say to its critics that Peter Pan's Flight must be doing something right after all these years. It certainly works for me and I'm obviously not alone. That's for indulging me as I gushed over Peter Pan. This is the first in a new series where I'll be zeroing in on my favorite attractions throughout Walt Disney World and ticking off a new Top 5 for each of them. As always, I'd like to hear what you have to say. Click on the link below, let me hear your thoughts on Peter Pan's Flight and I'll see you next time with another Disney Top 5.